There are 822 items available. Please enter a number less than or equal to 822. Wonderful! Fast shipping! Love it! Fast ship works great. Thank you! Fast Awesome Customer Service! Super Seller! THANKS!! Super fast shipping! Great item!! Thank You! Not in orginal box and Black do not work. Item was not in a package as shown. Tried black ink, works. These ink cartridges are the same real ink you would get at a store, but for a significant savings. It's the best price around. I have bought ink for several printers over the years, and if you can get one of these 'standard size' (not the extra large ones) for around $11 then you have found the best price. I used to teach overseas, and the ink was $60 over there, what a ripoff. Then I tried the ink refill routine - it works but you have to run several pages to get the refilled cartridges to print properly (what a waste) and IT'S A FREAKIN' MESS! Go with genuine but shop smart. Doesn't work in my printer! The black cartridge is the one that doesn't work, the color cartridge is just fine. They were both wrapped in the plastic packaging, but the black one doesn't work. Keeps giving my printer an error that it's an incorrect cartridge. 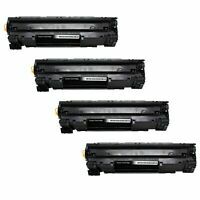 I'm really upset & would LOVE a replacement since I am unable to use my printer at the moment and print a lot of shipping labels. I got a great buy. Awesome product; great price. Easy to install. Works well with my printer. Print quality is awesome. Couldn't be happier. 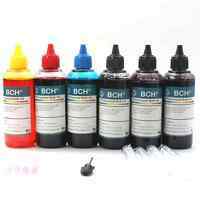 Will order from this Seller whenever I need HP cartridge ink refills. Good job, Seller!! Wonderful ink allowing me to print many things I want to. Always works just fine and I'm very happy. 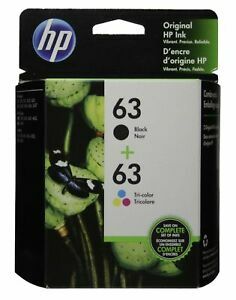 I'm so thankful in having this great #63 ink combo, both black and colors, that I tell everyone to buy it and enjoy the printing.